If you are paying for the full week, you can pay by credit card/PayPal using this form. If you are paying for individual dates and early drop off, please pay by cheque or BACS to the NNLS Office. Contact Naomi Minsky with any queries regarding Summer Scheme. Contact Accounts with queries regarding payment. Doors will open at 9.30am each day. Scheme finishes each day at 4.00 pm except Friday when we finish at 3.00pm. There are no facilities for late collection of children. 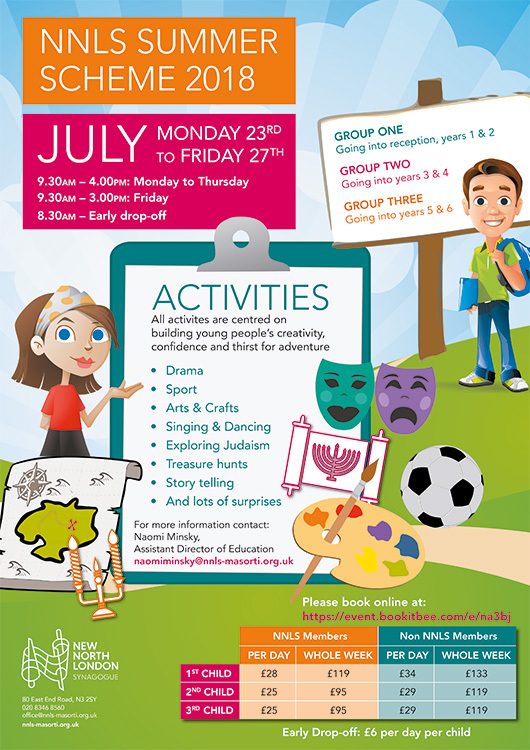 If you would be interested in an 8.30am early drop-off please email education@nnls-masorti.org.uk to register interest. Cancellations before 1st July 2018 will receive a full refund less a £10 administration charge. Cancellations on 1st July or later cannot be refunded because resources will have been purchased and staff hired. This event is organized by New North London Synagogue.